Aztec Fire - Pt.1 - Bb Clarinet/Bb Trumpet by Jay Bocook. Concert Band. For Bb Clarinet/Bb Trumpet. Contemporary. Individual instrument part. 1 pages. Duration 2:20. Published by Hal Leonard - Digital Sheet Music (HX.97672). This item is the replacement part to the concert band set. It is not recommended to purchase this as a solo piece. 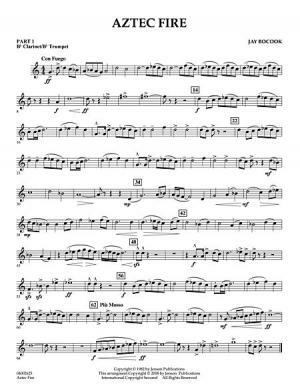 Instantly downloadable sheet music by Jay Bocook for band of MEDIUM skill level.